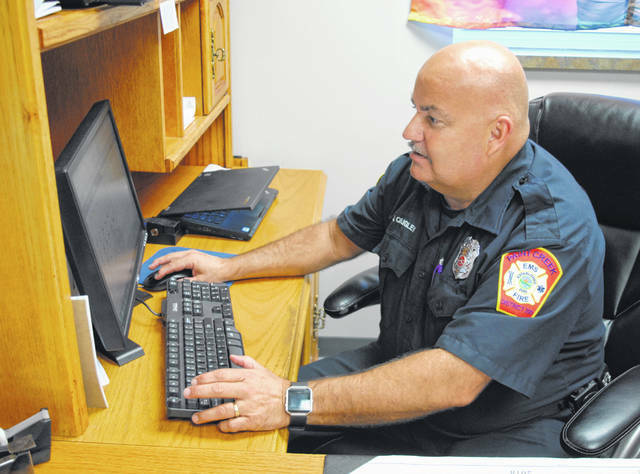 Jerry Quigley, Paint Creek Joint EMS/Fire District’s fire inspector, is shown in his office at Paint Creek’s Hillsboro station. Jerry Quigley, Paint Creek Joint EMS/Fire District’s fire inspector, says he has one goal: to prevent fires from breaking out at local businesses so his fellow firefighters don’t have to do their job. Quigley, a longtime firefighter and medic, told The Times-Gazette that he and about 10 other Paint Creek firefighters perform commercial fire inspections free of charge for businesses in Highland County, and while the inspections can sometimes incur costs for repairs or corrections that need to be made, he will do everything he can to work with businesses so they don’t get fined. “We want to be partners with the businesses,” he said, adding that he is often lenient on businesses if they show progress in complying with the fire code. Quigley, who has worked as a certified fire inspector and investigator at the state level, said the state fire code is hundreds and hundreds of pages long and often references outside sources. As a result, he said every fire inspector has a different idea of what to enforce. Quigley said he often emphasizes the importance of keeping exits clearly marked and free of clutter, but he also addresses lighting, proper use of extension cords, furniture placement and other elements. “I’m like the nagging wife,” he joked. Jackman said firefighting is one of the only trades where success is counted by days spent not working. “We actually try not to do our jobs,” Jackman said. Quigley said while he’s also a firefighter for the district, his main duty is to keep the firefighters at the station.